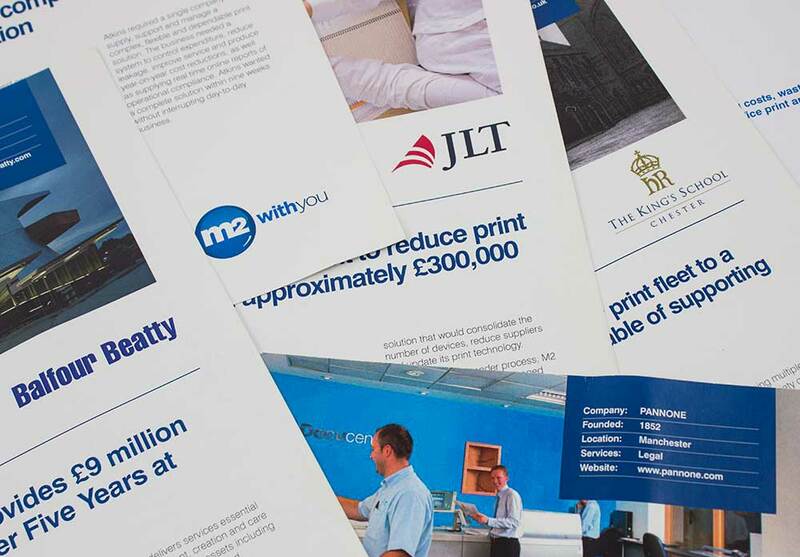 The UK’s leading independent Managed Print Services (MPS), M2 was looking to capture additional market share in this saturated marketplace. With a strong sales team and operational setup, M2 provide service excellence to SME’s and enterprise organisations, helping them to reduce wastage, improve security and maximise cost savings. With bespoke IT solutions and nationwide coverage, M2 were in prime position to expand but they weren’t getting quality leads to convert. Their website portrayed the business as a copier company rather than an IT MPS provider, reducing their credibility and limiting the visitor’s knowledge of their full proposition. When the sales teams were visiting prospects they were using presentations that had evolved over years, displaying different M2 logos, old styling and dated messaging. Another area which hindered their growth was an outdated sales database which had not been appended for some time. Key contacts had moved on and businesses had closed, resulting in a lot of wastage when campaigns were sent and disappointing results. A number of quick wins were identified, one of which was to update an existing range of cases studies. The case studies looked dated but told some great stories. 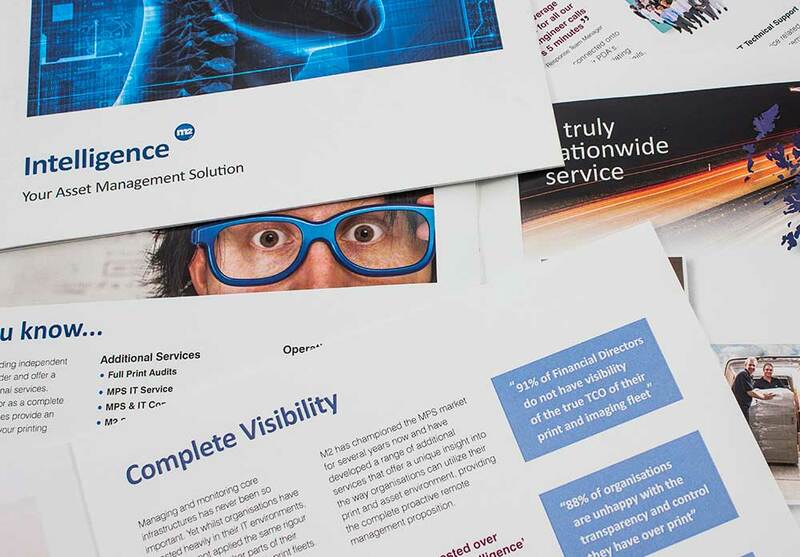 We redesigned them using the new brand style, utilising imagery and testimonials to emphasise key messages. If there were any gaps in sectors M2 excelled in, there were a wealth of customers that were only too happy to talk to us and discuss the unique, cost effective solutions M2 had installed and continue to manage for the new case study. In addition, the cases studies were used as content for a new 150-page PowerPoint presentation, providing the sales team with the ammunition they needed to sell to multiple sectors and business sizes. The database was next, stripping it back to basics and repopulating it with real-time data from M2’s other operational programmes. As a result the sales team were able to see customer files on their mobile devices, allowing them to access information whilst with the customer. It also enabled M2 to use the information to create campaigns targeted at individual sectors, business sizes and identify requirements for focused relevant campaigns. 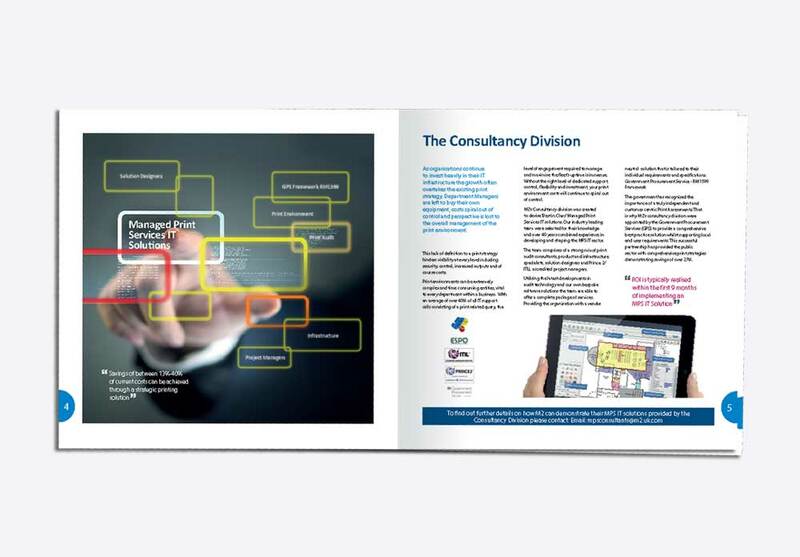 Utilising the relationship with M2’s partner, Quocirca, we commissioned a white paper with the renowned business and IT advisory. The brief was to understand the impact independent MPS providers could have on the Original Equipment Manufacturers (OEMs) hold on the sector. The results, although not surprising enabled M2 to promote their finds across collateral, communications and PR over the course of a year. M2 continue to grow from strength to strength, building on their dominance in this very competitive market.